Our original design, streamlined, solid-core construction, contemporary tabletop mirror is the perfect accessory for any bathroom, changing room, closet, or vanity. Commercial grade quality makes our mirror a favorite of 5 star hotels and luxury boutique hotels around the world. The contemporary lines are clean and sophisticated yet neutral enough to work in a variety of design aesthetics. 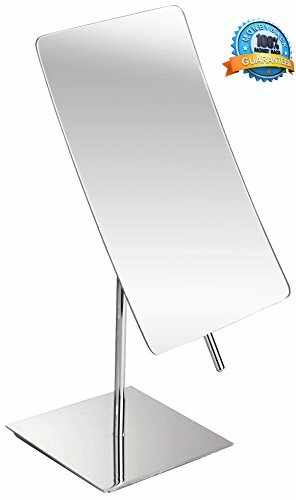 Our adjustable swivel rectangular mirror face measures 5.25 inches wide by 8.5 inches high. The base of the mirror is 4.5 inches by 4.5 inches. The overall height of the entire mirror is 12 inches with the bottom of the mirror starting at 4.5 inches from the base. The mirror tilts and swivels on a firm ball and socket joint with a minimalist looking adjusting bar. Turn the bar 90 degrees to use the magnified reflection in a wide format. The mirror is a perfect portable frameless design. The square mirror base includes rubber bumpers to protect your countertop from scratches or marks while providing a stable, sturdy base. Resistant to scratches and finger prints, the polished stainless steel finish works with contemporary, traditional, transitional, deco, eclectic and shabby chic design. USA Company with 3 Generations of Family Values. SOPHISTICATED DESIGN: Luxury, contemporary, products don't need to cost a fortune. Our sleek, modern, clean line, rectangle, mirror is a beautiful statement piece. Polished shiny stainless steel, frameless design. 5 TIMES MAGNIFICATION: The slightly curved, concave, surface area is magnified five times to allow you to easily see the details while applying makeup, cosmetics, or shaving and grooming.